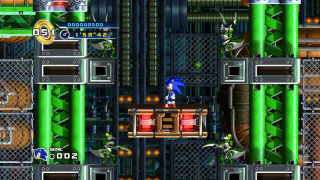 Mad Gear Zone is the fourth level in Sonic the Hedgehog 4: Episode I. It seems to be based largely on Sonic 2's Metropolis Zone, and includes the Asteron, Shellcracker, and Slicer Badniks from the same stage. The purpose of the Mad Gear Zone is to fully power up Metal Sonic, as revealed in Episode Metal. The gimmicks in this stage include steam pipes that blast Sonic, Metropolis-esque transport pipes, Cogs that Sonic can run on to open doors with, and a giant moving death wall in Act 3. Asteron - A badnik that attacks with shooting spikes when approached. Shellcracker - A badnik with a giant claw. Slicer - A badnik that throws its arms to kill you. This time, it will self-destruct after throwing its arms.